This page will consist of prints on paper including engravings, lithographs, etchings, woodcuts, and mezzotints which will depict various examples in the Portrait, Historical, Floral, Botanical, Decorative, Travel, and Miscellaneous Genres. The smaller items listed on this page can be shipped; the larger framed prints will probably have to be picked up by the purchaser. If a piece is marked Hold it has been reserved by a customer, if it is marked Paid we have received a check, and if it is marked Sold the transaction has been completed. To examine our latest additions please check out our New Listings. Please use the inventory number during correspondence to help us identify a particular item. 1550-57. Antique American Lithograph depicting the bust portrait of the "Hon. Le Grand G. Capers" drawn from life on stone by Charles Fenderich in 1848 and printed by E. Weber & Co. of Baltimore MD. Capers was appointed as the Appraiser of Goods for the Port of Charleston SC in 1832 by President Andrew Jackson and was serving as a Bureau of Indian Affairs Disbursing Agent in 1841; at the time of this portrait he has served as the United States Judge for Tampico and the Mexican state of Tasmolipas 1846-1848 during the Mexican War. 11.75" high x 10.0" wide inside matting; 21.2" high x 15.25" wide in the modern black aluminum frame. This lithograph was acquired in June 1981 at the dispersal sale of the famous Baltimore lithographers A. Hoen & Co. (August Hoen was a nephew and the successor to E. Weber). $ 150. 1550-58. Antique American Lithograph depicting the bust portrait of the "Peter Force" drawn from life on stone by Charles Fenderich in 1848 and printed by E. Weber & Co. of Baltimore MD. Peter Force (1790-1868) was in the War of 1812 and later served as councilman, alderman, and mayor (in 1836-1840) of Washington DC. He was the editor of The National Journal 1823-1841 but is perhaps best known as publisher of the nine volume American Archives, a collection of the most important documents of the American Revolution from 1774-1776, 12.0" high x 10.5" wide inside matting; 21.5" high x 15.25" wide in the modern black aluminum frame. 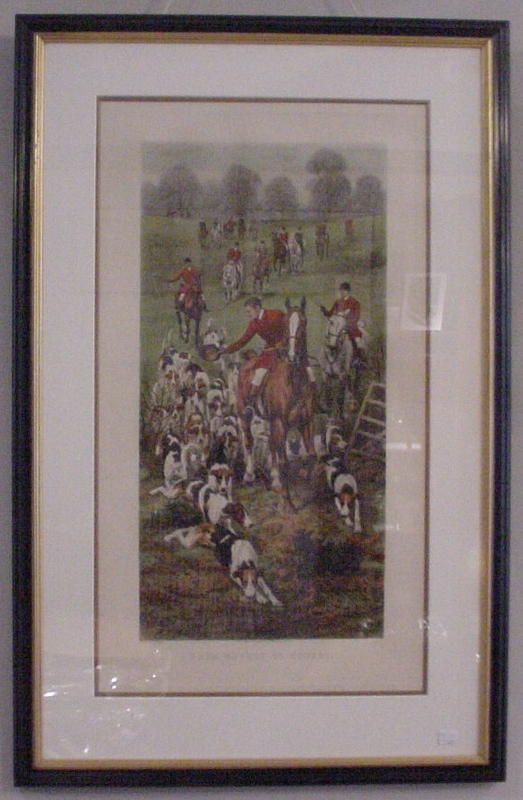 This lithograph was acquired in June 1981 at the dispersal sale of the famous Baltimore lithographers A. Hoen & Co. (August Hoen was a nephew and the successor to E. Weber). $ 150. 1560-58. Antique William IV Hand-colored Lithograph of the "Red-Footed Falcon, Falco rufipes (Bechs.)" depicting an adult female and male removed from Volume I of John Gould's five volume "The Birds of Europe" (London 1832-1837); "Drawn from Life & on Stone by J. & E. Gould" and "Printed by C. Hullmandel". 20.5" high x 14.0" wide sight size inside matting; 28.5" high x 21.6" frame size. Double matted under glass in 1985 by McBride Gallery of Annapolis in a narrow silvered frame. $ 375. 1560-57. Antique William IV Hand-colored Lithograph of the "Sparrow Hawk, Accipiter fringillarius (Ray), Falco nisus (Linn.)" depicting an adult female and a young male removed from Volume I of John Gould's five volume "The Birds of Europe" (London 1832-1837); "Drawn from Life & on Stone by J. & E. Gould" and "Printed by C. Hullmandel" 20.5" high x 14.0" wide sight size inside matting; 28.5" high x 21.6" frame size. Double matted under glass in 1985 by McBride Gallery of Annapolis in a narrow silvered frame. $ 375. 1566-39. Antique Victorian Hand-colored Lithograph depicting a "Common Curlew" lithographed by Wyman & Sons of London and included as Plate XCII in Volume 3 of "Lloyd's Natural History" by R. Bowdler Sharpe, c.1896. 4.25" high x 6.5" wide sight size inside the matting; 13.75" high x 16.25" frame size. 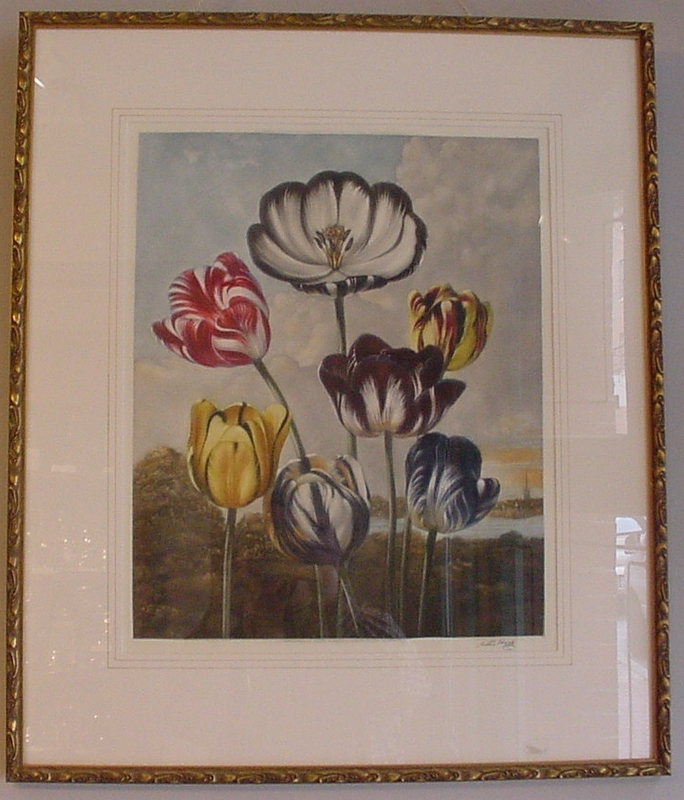 Double matted under glass in a modern gilt-edged black frame. $ 95. 1566-38. Antique Victorian Hand-colored Lithograph depicting a "Little Bittern" lithographed by Wyman & Sons of London and included as Plate LXVII in Volume 3 of "Lloyd's Natural History" by R. Bowdler Sharpe, c.1896. 6.75" high x 4.25" wide sight size inside the matting; 15.4" high x 12.8" frame size. 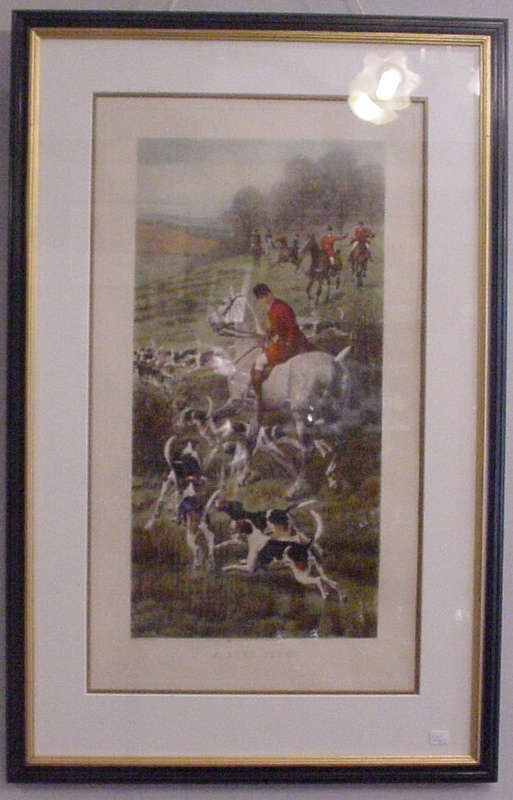 Double matted under glass in a modern gilt frame. $ 95. 1585-12. Antique Victorian Steel Engraving depiction of the “Principal Front of the Capitol Washington.” with later hand-coloring; originally drawn by William Henry Bartlett, engraved by R. Brandard, and published by subscription in 1839 and later included in American Scenery: or Land, Lake, and River Illustrations of Transatlantic Nature (George Virtue: London, 1840) with letterpress descriptions by Nathaniel P. Willis. The dome shown here was replaced in the 1850's with the present day dome. 1585-09. Antique Victorian Steel Engraving depiction of the "View of Baltimore." with later hand-coloring; originally drawn by William Henry Bartlett, engraved by S. Fisher, and published by subscription in 1839 and later included in American Scenery: or Land, Lake, and River Illustrations of Transatlantic Nature (George Virtue: London, 1840) with letterpress descriptions by Nathaniel P. Willis. The engraving almost appears to depict a romantic Mediterranean port view. 1585-08. Antique Victorian Steel Engraving depiction of the “Battle Monument, Baltimore.” with later hand-coloring; originally drawn by William Henry Bartlett, engraved by H. Griffiths, and published by subscription in 1838 and later included in American Scenery: or Land, Lake, and River Illustrations of Transatlantic Nature (George Virtue: London, 1840) with letterpress descriptions by Nathaniel P. Willis. The cornerstone was laid in September 1815 for this monument to the Baltimore defenders who lost their lives during September 12-13, 1814 at the Battle of North Point and the Bombardment of Fort McHenry. 1585-07. Antique Victorian Steel Engraving depiction of the “Washington's Monument, Baltimore.” with later hand-coloring; originally drawn by William Henry Bartlett, engraved by D. Thompson, and published by subscription in 1839 and later included in American Scenery: or Land, Lake, and River Illustrations of Transatlantic Nature (George Virtue: London, 1840) with letterpress descriptions by Nathaniel P. Willis. The cornerstone was laid in July 1815 for this, the earliest of the monuments to George Washington; the location is known as the Mount Vernon neighborhood. 1585-10. Antique Victorian Steel Engraving depiction of the “Viaduct on Baltimore and Washington Railroad.” with later hand-coloring; originally drawn by William Henry Bartlett, engraved by Henry Adlard, and published by subscription in 1838 and later included in American Scenery: or Land, Lake, and River Illustrations of Transatlantic Nature (George Virtue: London, 1840) with letterpress descriptions by Nathaniel P. Willis. The Thomas Viaduct was designed by Benjamin H. Latrobe for the Baltimore & Ohio Railroad where it crosses the Patapsco River near Elkridge and is the oldest stone-arch railroad viaduct in the United States. 1585-20. Antique Victorian Steel Engraving depiction of “Black Mountain (Lake George. )” with later hand-coloring; drawn by T. Creswick after a sketch by William Henry Bartlett, engraved by Robert Wallis, and published by subscription in 1838 and later included in American Scenery: or Land, Lake, and River Illustrations of Transatlantic Nature (George Virtue: London, 1840) with letterpress descriptions by Nathaniel P. Willis. Depicts Black Mountain on the eastern shore overlooking a steam boat and a stag that has been chased into Lake George by dogs. 1585-26. Antique Victorian Steel Engraving depiction of “The Two Lakes and the Mountain House on the Catskills.” with later hand-coloring; originally drawn by William Henry Bartlett, engraved by J. C. Bentley, and published by subscription in 1838 and later included in American Scenery: or Land, Lake, and River Illustrations of Transatlantic Nature (George Virtue: London, 1840) with letterpress descriptions by Nathaniel P. Willis. The Mountain House Hotel overlooking the Hudson Valley was built in 1824 and could be reached after a five hour stagecoach ride from Palenville(?) NY; it remained the prime New York state wilderness tourist destination until being eclipsed by the Adirondacks in the 20th century. 1585-21. Antique Victorian Steel Engraving depiction of “Rail-Road Scene, Little Falls. (Valley of the Mohawk. )” with later hand-coloring; originally drawn by William Henry Bartlett, engraved by R. Sands, and published by subscription in 1838 and later included in American Scenery: or Land, Lake, and River Illustrations of Transatlantic Nature (George Virtue: London, 1840) with letterpress descriptions by Nathaniel P. Willis. Depicting an early railroad locomotive hauling passenger carriages with the town of Little Falls and the Mohawk River in the background. 1585-22. Antique Victorian Steel Engraving depiction of “View of the Erie Canal Near Little Falls.” with later hand-coloring; originally drawn by William Henry Bartlett, engraved by J. T. Willmore, and published by subscription in 1838 and later included in American Scenery: or Land, Lake, and River Illustrations of Transatlantic Nature (George Virtue: London, 1840) with letterpress descriptions by Nathaniel P. Willis. Depicts a dramatic view as the sun sets behind a high bluff above the canal. 1585-23. Antique Victorian Steel Engraving depiction of “Lockport, Erie Canal .” with later hand-coloring; originally drawn by William Henry Bartlett, engraved by W. Tombleson, and published by subscription in 1838 and later included in American Scenery: or Land, Lake, and River Illustrations of Transatlantic Nature (George Virtue: London, 1840) with letterpress descriptions by Nathaniel P. Willis. Depicts an eastern view of the canal from the series of five locks that was the last great rise in elevation prior to Lake Erie. 1585-14. Antique Victorian Steel Engraving depiction of “The Ferry at Brooklyn, New York.” with later hand-coloring; originally drawn by William Henry Bartlett, engraved by G.K. Richardson, and published by subscription in 1838 and later included in American Scenery: or Land, Lake, and River Illustrations of Transatlantic Nature (George Virtue: London, 1840) with letterpress descriptions by Nathaniel P. Willis. The ferry is an early example of a steam powered boat. 1585-15. Antique Victorian Steel Engraving depiction of “View from Gowanus Heights, Brooklyn.” with later hand-coloring; originally drawn by William Henry Bartlett, engraved by Henry Adlard, and published by subscription in 1839 and later included in American Scenery: or Land, Lake, and River Illustrations of Transatlantic Nature (George Virtue: London, 1840) with letterpress descriptions by Nathaniel P. Willis. Depicts the view west down to Gowans Cove. 1585-13. Antique Victorian Steel Engraving depiction of “The Park and City Hall, New York.” with later hand-coloring; originally drawn by William Henry Bartlett, engraved by S. Lacey, and published by subscription in 1838 and later included in American Scenery: or Land, Lake, and River Illustrations of Transatlantic Nature (George Virtue: London, 1840) with letterpress descriptions by Nathaniel P. Willis. Activities include a marching militia company as well as numerous horse-drawn carriages. 1585-18. Antique Victorian Steel Engraving depiction of “View of New York From Weehawken.” with later hand-coloring; originally drawn by William Henry Bartlett, engraved by Robert Wallis, and published by subscription in 1839 and later included in American Scenery: or Land, Lake, and River Illustrations of Transatlantic Nature (George Virtue: London, 1840) with letterpress descriptions by Nathaniel P. Willis. Depicts a view of southern Manhattan Island from the New Jersey side of the Hudson River. 1585-16. Antique Victorian Steel Engraving depiction of “New York Bay. (From the Telegraph Station. ).” with later hand-coloring; originally drawn by William Henry Bartlett, engraved by Robert Wallis, and published by subscription in 1838 and later included in American Scenery: or Land, Lake, and River Illustrations of Transatlantic Nature (George Virtue: London, 1840) with letterpress descriptions by Nathaniel P. Willis. Depicts the view looking north from the Staten Island location. 1585-17. Antique Victorian Steel Engraving depiction of “Narrows from Staten Island.” with later hand-coloring; originally drawn by William Henry Bartlett, engraved by E. Finden, and published by subscription in 1837 and later included in American Scenery: or Land, Lake, and River Illustrations of Transatlantic Nature (George Virtue: London, 1840) with letterpress descriptions by Nathaniel P. Willis. Depicts a view of the future site of the Verrazanos-Narrows Bridge. 1585-24. Antique Victorian Steel Engraving depiction of “View on the Susquehanna. (above Owego)” with later hand-coloring; originally drawn by William Henry Bartlett, engraved by C. Cousen, and published by subscription in 1839 and later included in American Scenery: or Land, Lake, and River Illustrations of Transatlantic Nature (George Virtue: London, 1840) with letterpress descriptions by Nathaniel P. Willis. Depicts a valley with a small town above the river bank and two channels forming an island. 1585-19. Antique Victorian Steel Engraving depiction of “View of the Ruins of Fort Ticonderoga.” with later hand-coloring; originally drawn by William Henry Bartlett, engraved by T. A. Prior, and published by subscription in 1837 and later included in American Scenery: or Land, Lake, and River Illustrations of Transatlantic Nature (George Virtue: London, 1840) with letterpress descriptions by Nathaniel P. Willis. Depicts the view to the southwest beyond the few remaining standing walls with the setting sun overlooking a number of small sailing boats. 1585-25. Antique Victorian Steel Engraving depiction of “Trenton High Falls” with later hand-coloring; originally drawn by William Henry Bartlett, engraved by C. Cousen, and published by subscription in 1838 and later included in “American Scenery: or Land, Lake, and River Illustrations of Transatlantic Nature” (George Virtue: London, 1840) with letterpress descriptions by Nathaniel P. Willis. Named “Kauy-a-hoo-ra” (Leaping Water) by the Mohawk Indians; it was a popular tourist attraction in Oneida County NY. 1585-11. Antique Victorian Steel Engraving depiction of “Harpers Ferry. (From the Potomac side. )” with later hand-coloring; originally drawn by William Henry Bartlett, engraved by W. Radclyffe, and published by subscription in 1839 and later included in American Scenery: or Land, Lake, and River Illustrations of Transatlantic Nature (George Virtue: London, 1840) with letterpress descriptions by Nathaniel P. Willis.